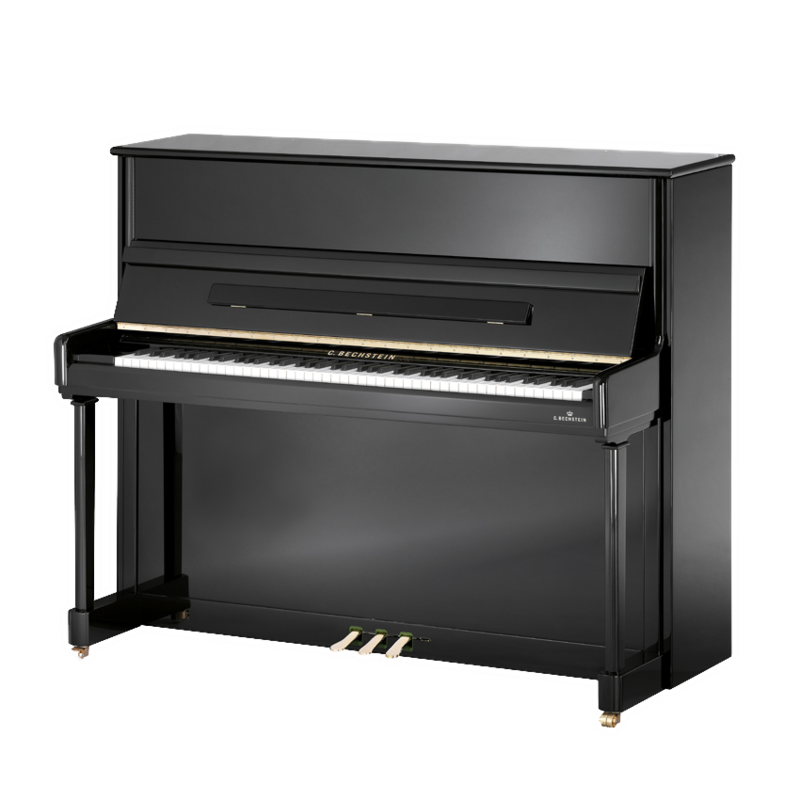 The C. Bechstein Elegance 124 upright piano is a feast for eye and ear, an upright piano for the highest demands. Visually impressive is the restrained elegance: Flowing lines and intricate details combine to form an elegant cabinet composition. This piano is one of the most successful models of C. Bechstein’s piano palette. Even in the high-quality area solidity and elegance can be linked together harmoniously. Inside the cabinet the award-winning, “acoustic body 11,” for many decades a byword of excellent upright piano-architecture. Pianos from the C. Bechstein piano factory are produced individually by specialists for C.Bechstein upright pianos, as custom made. Many details come from grand piano-building and make the C. Bechstein Elegance 124 upright piano a timeless, valuable investment.The optics of C. Bechstein Elegance 124 upright piano can be adapted precisely to your requirements: whether rich mahogany wood, noble cherry or other special woods like vavona and burl wood, all possibilities are open to you. Upright pianos with the height of the Model C. Bechstein Elegance offer plenty of room for unfolding its wonderful acoustic system. This piano will become the focal point in your home. The C. Bechstein Elegance 124 upright piano demonstrates excellent musical taste. The C. Bechstein Elegance 124 upright piano is also available with the C. Bechstein Vario System, which allows you to practice day and night without disturbing roommates or neighbours.